I will always find classic books like Flap Your Wings by P. D. Eastman endearing. This one has such a fantastic message too. I LOVE how the birds take care of the egg and the little fella that hatches out of it despite their differences. Follow that egg! Roly-Poly Egg by Kali Stileman is a simple book for tots all about bright, bold, egg chasing fun! With a surprise flap at the end! Horton Hatches the Egg by Dr. Seuss (apparently Whitney has never actually read this one?!?!?) is quite possibly my favorite Seuss book. Horton is the very best… he perseveres, and in the end things turn out just the way they should! Foxy and Egg is just the cutest! Foxy invites the egg in thinking she'll fatten him up and enjoy a delicious breakfast…turns out eggs aren't always as they seem! I love love love the ending of this book! For another book of unusual hatchings we have The Odd Egg by Emily Gravett. This book has a cool gimmick in the flaps of the pages- I love that! The illustrations are lovely. These egg books are filled with messages of patience. The world could use more of that! How about the original Duck & Goose ! In their debut story by Tad Hills, our feathered friends have found an egg and each wants to claim it for his own. Despite the quarreling at first, they end up having a ball-- literally-- they find out the egg is actually a ball! Then there's good old Hedgie's Surprise by Jan Brett. That naughty Tomten keeps stealing her eggs! How's she ever going to get a brood of chicks when she can't keep her eggs safe? Thank goodness Hedgie comes to the rescue. Remember how much my kids like The Cow That Laid an Egg by Andy Cutbill? 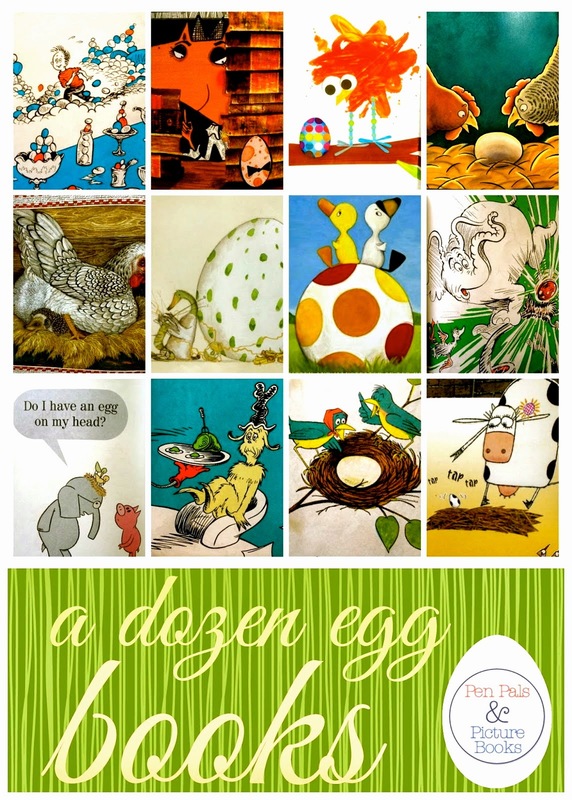 The chickens who want to help their friend, the cow with unconditional love for an egg, the quirk sweet illustrations! Its a good egg…book!! Scrambled Eggs Super! (another Seuss classic) has every type of bird and egg you could ever imagine (as well as a whole bunch you never could). Take a deep breath before you take on the task of reading this one aloud! In Zinnia and Dot by Lisa Campbell Ernst, we meet two proud mother hens who love nothing more than bragging about their eggs, but when their bragging gets out of hand a weasel jumps into the hen house, snatching all the eggs but one…will they be able to work together and help this little egg hatch? And then there's Elephant and Piggie at their very best in There Is a Bird On Your Head! by Mo Willems. It's a modern day classic. Birds building a life (including laying and hatching three eggs) on the head of an elephant… it doesn't get better than that. Last but not least, Green Eggs and Ham !! What egg book list would be complete without this? Do you like it on our list, now I hope you get the just. We like this book here or there! Well, we like it anywhere! Stay tuned for nonfiction egg books, coming soon!